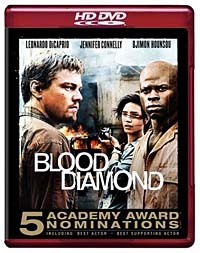 Previously released June 5th, 2007 on Blu-ray, Warner’s Blood Diamond was also released July 3 on HD DVD. This is movie that the De Beers company loves to hate, Blood Diamond actually received less mainstream press than I thought it would upon its premier last year. I figure most of the outrage against “blood” or conflict diamonds has already been generated from years of media reports covering the West African conflicts and South African profiteering that occurred during the 1990’s and eventually ended up in a process for ferreting out illegal diamonds mined out of war zones in order to illegally finance insurgent forces and their respective warlords. This process, called the Kimberley Process Certification Scheme (with “Scheme” sounding kinda sketchy, don’tcha think?) is supposed to create transparencies in the diamond trade and make those declaring their effusive love each other feel good about putting a high-grade, 4-C rock on the ol’ ring-finger. And that, with the development of character archetypes we care about, is basically the plot for this earnest film that offers plenty of bloody action for the gung-ho and grim reminders for the socially conscious. The acting earned plenty of awards nominations, but some might find the characters to be rather two-dimensional as they race to find a rare pink diamond and discover the true meaning of Christmas (I’m kidding about that last part).